There seem to be a lot of opinions when it comes to cold soup. Some culinary friends of mine consider them to be an ugly step-child of proper soup, others just think they’re silly. (“Just call it a smoothie,” I overheard once.) I remember at one of my first dinner parties after I moved to New York, one guest tasted my cold tomato and corn soup and said, “This would be great, if it weren’t cold.” And with that recipe, I didn’t disagree. 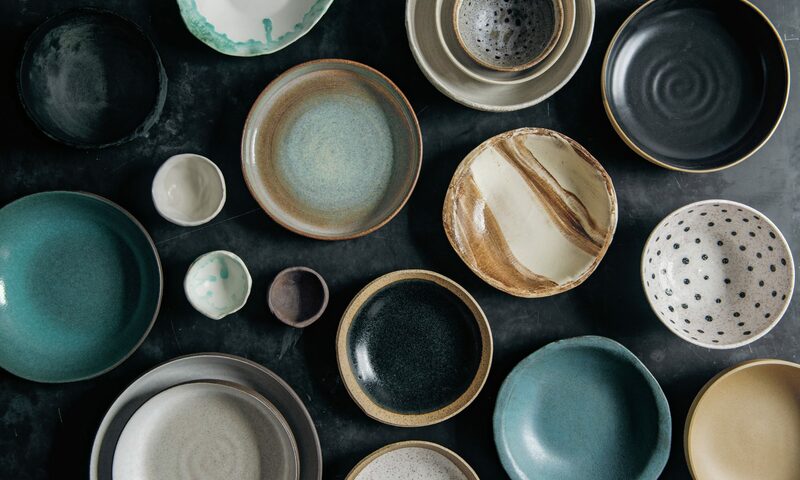 But I really only anguish about cold soups for so long, until I remember their plain, straightforward appeal, which is: soup that is cold, to be enjoyed when it is hot outside. 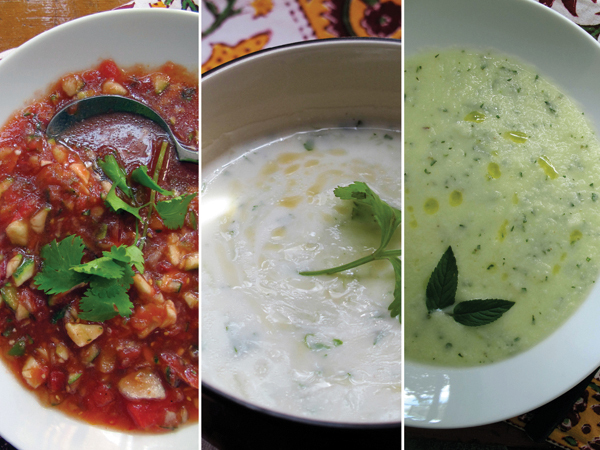 The best cold soups, and forgive me for perhaps stating the obvious, are those that can’t be served hot. 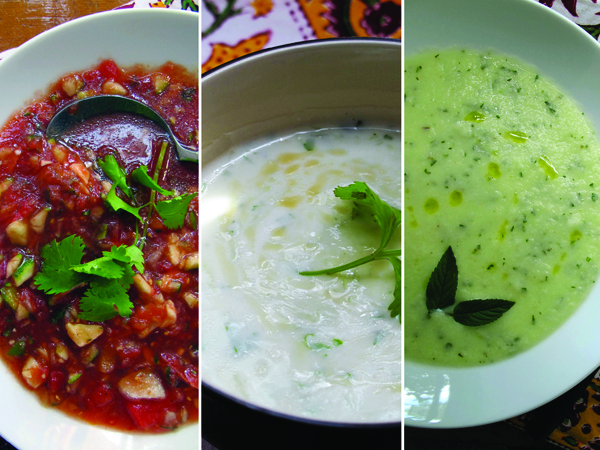 And the following three are good examples of that: gazpacho should taste like unadulterated summer; cucumber-yogurt soup would curdle if it were hot; and I’ve never tried to heat up a honeydew, but the idea of it isn’t very promising. 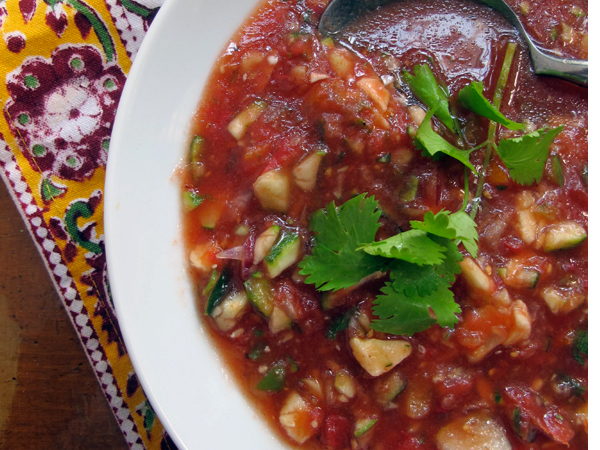 Gazpacho, for anyone not familiar, is what I like to think of as salsa soup. It should only be made when the summer produce is at its peak—honestly don’t bother using a subpar tomato, it won’t be worth it. It’s an easy type of dish to improvise based on what you have on hand, but I’ve made a couple disappointing gazpachos in my life. Fairly late in the game I realized that the thing to get right is the salt and the acid (which is true of most dishes, come to think of it). Taste carefully as you go along. Also, it will improve in flavor after it’s rested in the refrigerator overnight. 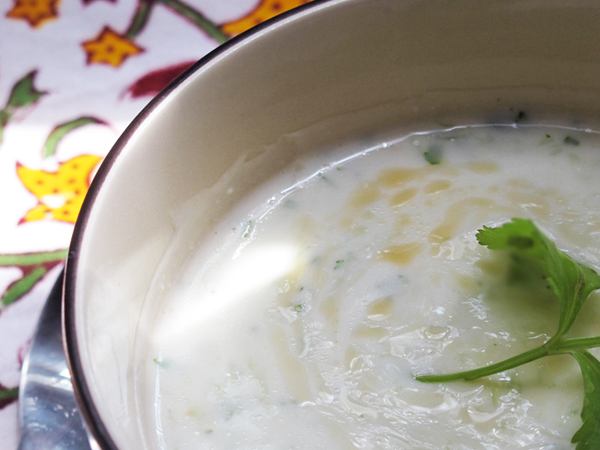 Cucumber-Yogurt Soup makes me think of the 1980s, which, if I’m not mistaken, were a real heyday for cold soups. It’s not the kind of thing I order out very often, but I enjoy making it at home. It’s comforting, as far as hot-weather foods go. I like the addition of ginger—I tend to like the addition of ginger to most things—and the rich but faint, nutty profile that toasted sesame oil brings to the dish. I also always make it with low- or nonfat dairy, and I find that this keeps it from becoming unweildy, but if you prefer the full-fat stuff, by all means go for it. And then Honeydew Gazpacho! I’d never have even thought of such a thing had my friend Meghan not sent me her recipe. She learned it from her friend’s Spanish madre, and her recipe is just a list of ingredients with no quantities, which is how she learned it. I’m giving some quantities below, and as usual, I can’t resist offering my own spin. It’s the lightest of these soups, and will probably be a real surprise to your palate—this one falls squarely on the bridge of sweet and savory. But it’s a refreshing thing on a hot day in the park if you can keep it cold in a cooler or thermos, or as a starter for a non-picnic dinner party on the deck, garnished with frozen grapes. Cut the tomatoes, cucumbers, and zucchini into rough chunks. Add each vegetable, separately, to a food processor, and pulse until finely chopped (but not turned to paste), adding the chopped vegetables to a large mixing bowl as you go. (Alternatively, cut these vegetables by hand if you don’t have a food processor.) Stir in the remaining ingredients. Taste carefully for balance of salt and vinegar, and add more tomato juice if the soup seems too thick. For best results, allow the soup to rest overnight in the refrigerator before serving. Serve cold, garnished with cilantro if you please. Pound the garlic, ginger, and salt in a mortar and pestle until it’s turned into a paste. Add to a mixing bowl with the rice vingar and let stand for at least 10 minutes. Alternatively, finely mince the garlic, grate the ginger, and stir with the salt and vingegar in a mixing bowl and let stand for 10 minutes. Add the yogurt and milk to the mixing bowl and whisk to combine. Grate the cucumbers using the large holes of a box grater and add them to the yogurt. Stir in remaining ingredients. Taste carefully, adding additional salt, acid, and sesame oil as needed. Serve cold, garnished with cilantro and a few drops of sesame oil swirled in impressionisticly with a toothpick or tip of a knife. 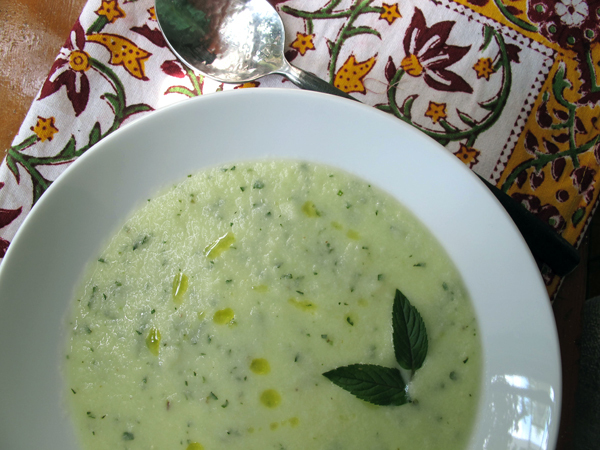 Place the olive oil, garlic, and shallot in a blender and blitz until frothy and pureed. Add the honeydew and cucumber and puree until smooth, which will take about 30 seconds. Transfer to a mixing bowl and add the lime juice, salt, herbs, and white pepper. Taste carefully. Serve cold, garnished with mint leaves if desired. I’m thrilled to have found your blog! I’ve made nearly every veggie burger in your book and can’t wait for the second one. I pre-ordered it on amazon. Keep it up!